Type c to Gigabit EthernetRJ45 Ports- Wi-Fi dead zones No! Connecting to the Internet is best choice for streaming large video files, playing online games, downloading a software through a wired home or office LAN; USB 3.1 C to Ethernet adapter provides faster data transfers and better security than most wireless connections. Type c Power Delivery Port - Continue charging your USB-C powered laptop or using Type-C USB device via Type-C Power Delivery throughput port. Allows you to charge your 12 inch Macbook, Google new Chromebook Pixel and other devices with type C port. 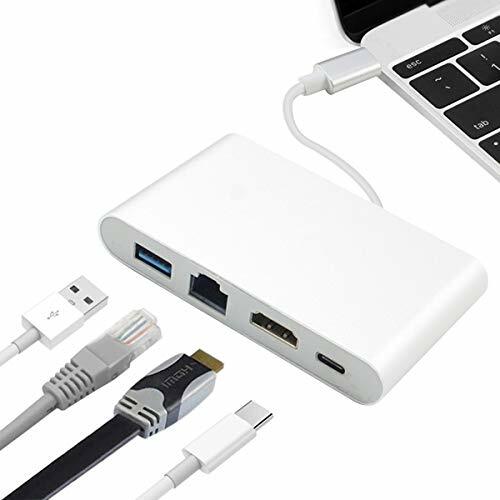 USB 3.0 Type A Port - USB 3.0 ports support data transfer rates up to 5Gbps ,USB3.0 port for to USB flash drive/ Mouse/ Keyboard / HDD for syncing &charging your iphone or other devices.